Pet Vaccinations – Unveil the Hidden Truth behind It! What you need to know about Pet Vaccinations? Vaccination is one of the hot topics discussed among veterinarians, animal health care centers, pet shelters and few of the most active pet parents. The main reason why vaccination has become the center of attraction of the present pet medical scenario is its importance along with side effects. When looking into the matter at one point we want to protect our furry pals from dreadful diseases and on the other hand, we are concerned about the health issues arising due to normal to over-vaccination. When you look at the vaccination arena in humans, you will find that human babies are only vaccinated once and are protected for the rest of their lives. But, the same thing is not applicable when it comes to animals. Well, most pet owners are rarely aware of this and are blind about the truth behind pet vaccinations. They usually get reminders from veterinary offices for the annual booster shots time. Furthermore, most of the veterinarians also don’t consider the new research studies in the fear of losing the income they are gaining due to booster doses. 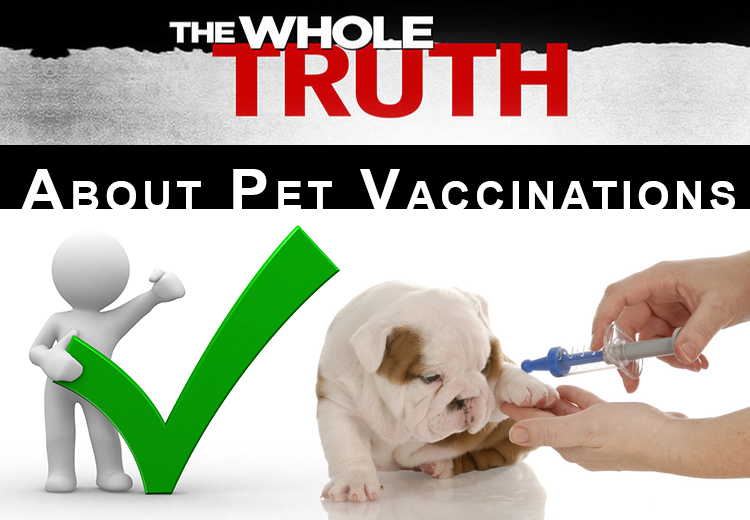 Let us dwell little deeper into this pet vaccination topic and find out the truth about it. It’s a fact but unknown to most pet owners that vaccinations when given happens to be a major stress factor affecting the immune system in pets. Not limited to just side effects and allergic reactions, vaccinations given to pets even pave way to long term chronic diseases for the poor animal to suffer. Certain chronic health issues arises in furry pals frequently just after the vaccination program. Skin allergies, arthritis, leukemia, upper respiratory infections, and irritable bowel syndromes, neurological conditions including aggressive behavior and epilepsy, autoimmune diseases and cancer are few of them to name some. Vaccination is must for pets but not over dosed, which at present is being practiced by most of the vets. Vaccines do help prevent fatal ailments, but should be used under control. Being a responsible pet parent, you should always consider risk factors before vaccinating your pet. If you have Russian Blue, Javanese or Ragdoll – all indoor cat breeds, and is never exposed to unvaccinated animals, then you can avoid giving vaccination as risk of infection is lower. Vaccinating your pet totally depends upon you, after a good research you can decide which vaccination your four-legged companion requires. Certain vaccinations such as Bordetella, corona virus, Lyme vaccines or leptospirosis are not essential unless they are locally widespread. Currently, clinical leptospirosis is not infected to pets so it’s not a useful vaccine in the present scenario. Never vaccinate sick or debilitated animal or weaned puppy or kitten. If your puppy or kitten showing signs of allergy, wait for the time being. Administering a vaccination on affected immune system is almost sure to complicate the situation. Research and educate yourself about pet vaccination. Your vet will not do this for you. Your lovable companion is your responsibility. You need to provide him/her the best and carefully decide about their healthcare protocol. Remember that vaccination is important for your pet but over-dosing may seem to be dangerous and can even put your pet at risk.